RRB NTPC Recruitment for more than 35,000+ various job profiles under Indian Railways all over India. Indian Railways recruitment department is looking to filling up the vacant posts of “Clerk, Trains Clerk, Traffic Assistants and Other job profiles” through this Railways Recruitment Board Recruitment 2019. ARE YOU LOOKING FOR RAILWAY JOBS IN INDIA? If yes than here is the open opportunity for all India candidates. RRB Recruitment department active the link for applying online today on 1st March 2019. 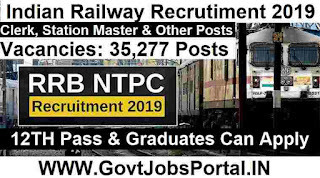 The official LINK for accepting online application related to this RRB NTPC Recruitment 2019 is active now. Beware of FAKE website related to this recruitment process, we shared all the official link below in this article. Below we are going to share the various job profiles which are going to be filling up through this RRB Recruitment 2019. These are the job profiles for which only 12th pass candidates can apply. 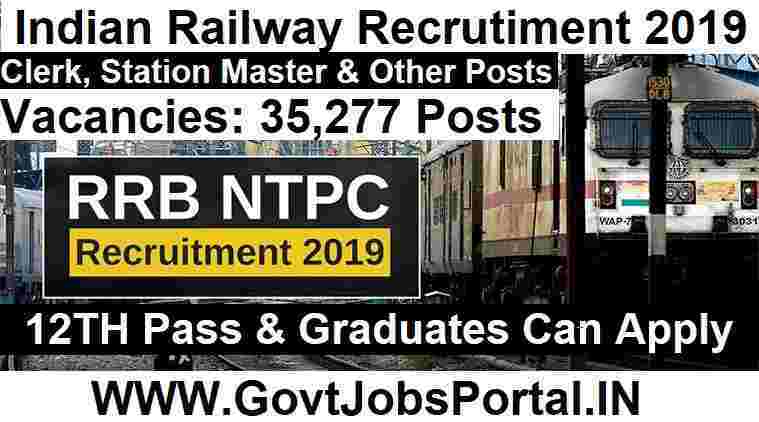 Above Section we share about the vacancies for 12th pass candidates under this RRB NTPC Recruitment 2019. Now in this section below we are going to explain about the various vacancies for which only Graduate candidates are eligible to apply. In the table below we are going to explain about the various vacancies to be filled up in the various Cities (Or) Railways Board and according to the various cast categories from which candidates belongs from. Check the table for more information related to this RRB NTPC Recruitment 2019. 12th Pass under any stream can apply for this RRB NTPC Recruitment 2019. Age Criteria for 12th Pass Candidates: 18 years to 30 Years. Age Criteria for Graduates: 18 years to 33 Years. Paying Way: Candidates can pay the application fee/Examination fee through Debit/credit card or Net Banking or challan in any branch of SBI or Computerized Post Office Pay-in-Slip. 1ST March 2019 is the Start Date to Apply. 31st March 2019 is the Last Date to Apply.